Reaching the point where your children no longer believe in Santa can be upsetting for both kids and parents alike. Perhaps they had things spoiled for them at a young age by peers, or maybe they’ve simply reached the age where the magic has been suspended. Santa is such a large focal point of the season. You probably mentioned him in passing in the months leading up to Christmas, warning your kids that “Santa is always watching.” It had become tradition to sit down with your kids at the beginning of December to help them write their Christmas lists and address them to the North Pole. And don’t forget Christmas Eve, watching as your kids giddily left cookies and milk out for the man in red, the anticipation of Santa’s visit making their eyes gleam. With these traditions behind you, it can be understandably difficult to know how to move forward with Christmas without Santa being a main feature for your kids. One of the best things you can do to keep the magic alive is to shift their attention to other important aspects of the season. Use the following activities to reinforce concepts traditionally associated with the holidays, reminding your kids there is wonder to be had in more than just presents. Remind your children of the message that “it is more blessed to give than receive.” Kids can learn to appreciate this more by buying small gifts for their friends and siblings. Handmade cards in particular are often the items that become the most treasured. They’ll soon realize that anticipation goes both ways, as they’ll be excited to watch the reactions of their friends and family members as they open their gifts. You could also look out for shoe box appeals or similar programs at local churches or schools. Making a gift or putting together a box of gifts of their choice for a less fortunate family will give your kids a sense of meaning. While Christmas is the time of year most associated with family, in this modern world some people are sadly neglecting this aspect of the holidays. 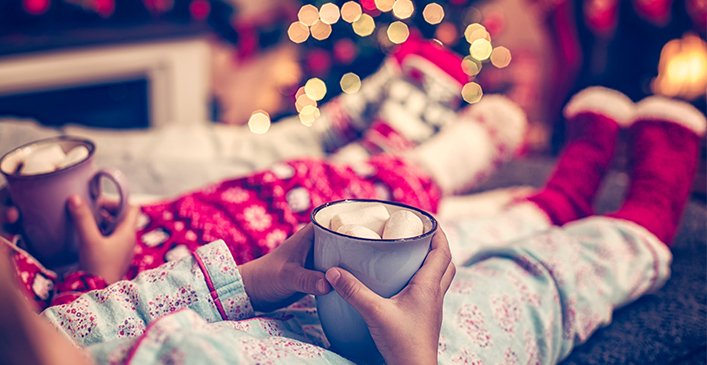 Instead, commitments with colleagues and friends become a priority, with others even opting to spend time alone to save themselves from the stresses of the season. However, making sure to prioritize spending time with your family, both extended and immediate, can help strengthen bonds between members. By making plans and putting family first, you will demonstrate to your children the importance of making time for family around the holidays. Quality family time takes many different forms. You can find events going on in your area that you can attend as a family. You can also host a games night at your home, inviting relatives over for traditional board games or other Christmas-related activities. When it comes to your immediate family, plan a candy treasure trail and spend some time baking Christmas cookies. In my household we love to bake gingerbread men and hang them on the tree (if they survive that long without being eaten!). Instead of decorating the tree haphazardly, make an occasion out of it, making sure all your family members are present and contributing. Little family moments like these throughout the month will give you and your kids a warm, fuzzy feeling of belonging and security. from a young age, kids are fascinated with pretty lights and colors (there’s something special about these for adults too). Make the most of the beautiful lights strung all over town during Christmas by wrapping your kids up warm and taking them for a walk to look at the lights on houses and displays set up by the city. You could even have a competition where you judge the best decorated houses. If you have a lot of presents to deliver, you could adopt a similar policy when traveling by car. I find the journeys seem to go so much faster for my boys if they count the number of decorated houses on the drives back at night from delivering presents to friends and relatives. There are many other aspects to emphasize here too. Draw their attention to the glitter of the snow as the light from streetlights plays off its pristine surface. Point out the festive smells of the season, such as that of Christmas trees and gingerbread in the oven. Remind them how being out in the chilly weather makes it feel so wonderful to go into the toasty house. It is the little things that make the season feel so special, so point out your favorite details to them so your kids can learn to appreciate them too. Christmas can be a stressful time and with the year coming to a close it can be easy to focus on all of the struggles of the past 12 months. Instead of focusing on the setbacks and checklists, put effort into thinking of all that you take for granted. You could even use this opportunity to make a fun game of listing the things you are grateful for with your family, to see who can come up with the most. This will help change not only your perspective, but the perspective of your kids’ throughout the season. There is nothing better than watching your child’s face light up with excitement when they open the gift they “always wanted” on Christmas morning. Because of this it can be tempting to buy your kids every expensive item they’ve asked for. However, a few subtle activities using smaller gifts will give them an appreciation for the little things in their life as well as make one or two larger gifts all the more special. One way to do this is to make your own advent calendar with small gifts behind each window for your kids to pick out each day. You could also demonstrate the importance of being grateful though Christmas movies which convey this message. Two movies that spring to mind immediately here are A Christmas Carol and It’s a Wonderful Life. Both convey the message of being thankful for what you have by showing different possibilities of how your life could be different!